The overall rate for General Invalid Traffic in Q4 continued a downward trend versus Q4 of 2017. 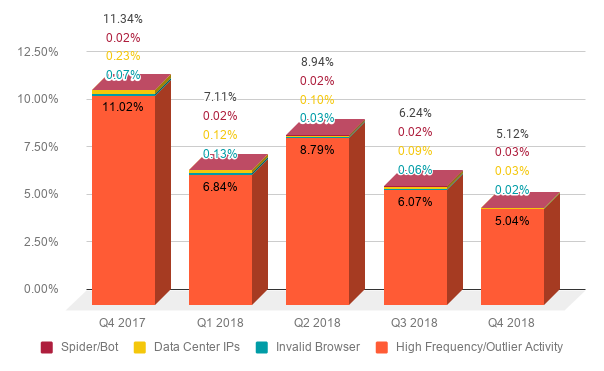 High Frequency/Outlier Activity remains the leading reason for filtration, while the Invalid Browser rate has declined significantly since spiking in Q2 of 2018. In Q4 of 2018, we saw an uptick in Spider/Bot activity, but it remains very low, at .13%, particularly compared to the 3.35% rate of High Frequency/Outlier seen in the same quarter. 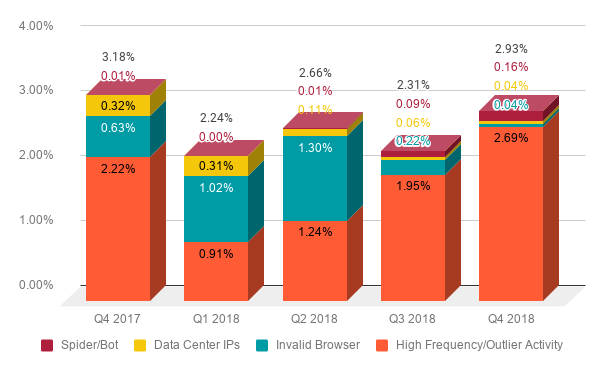 The rate of GIVT on premium publisher sites in Q4 2018 was higher than every other quarter of the year, but still slightly below that of Q4 2017, and a very small percentage of overall impressions. Among media aggregators, high frequency/outlier activity also leads the reasons for GIVT. Rates fell significantly from 11.02% in Q4 2017 to 5.04% in Q4 2018.